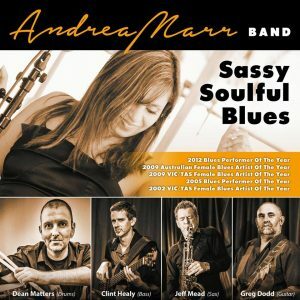 Multi-award winning Andrea Marr has been playing her brand of sassy, soulful, original blues since 1999, winning a swag of awards and accolades along the way. She has twice represented Australia in the International Blues Challenge in Memphis TN, reaching the Semi-Finals in 2013. With 6 albums under her belt, Andrea’s music has been described as high energy, joyful music with a true Memphis soul edge. The Andrea Marr Band was also formed in 1999 and has become one of the hardest working, most sought after blues bands in the thriving Melbourne Blues Scene. They have played headline spots at blues festivals all around Australia and deliver a great show every time. Guaranteed to make you holler for more and put a smile on your face. 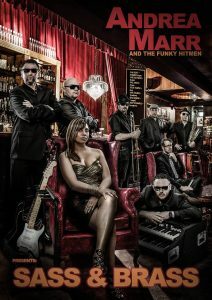 Andrea Marr & The Funky Hitmen came together to record an EP “Sass & Brass” in June 2012. When they did their EP launch at Cherry Bar in Melbourne in January 2013, they decided this was too good not to continue, so the band began and they have been doing some killer shows with rave reviews and have a whole host of festival appearances coming up. This show combines Andrea’s love of Soul, Funk, Blues and Gospel surrounded by some of the FINEST musicians in the country. See for yourself at www.youtube.com/AndreaAndFunkyHitmen for live footage of our launch.